Marketing without a strategy is like a blind dragon – it can breathe fire and cause destruction (usually to your budget) but without purpose. At the next STARTER programme workshop, you will learn who is your customer, how to reach your customer and how to sell your service & product. Marketing workshop will consist of a lecture part and also practical teamwork! 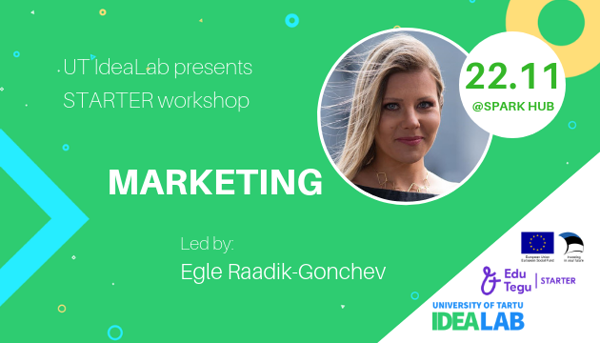 The workshop is led by Egle Raadik-Gonchev. She is a marketer with a business development background. She is focusing on Estonian companies that need help with global e-commerce platform Amazon. Her heart is set on a goal to double through Amazon as many Estonia's companies revenues, as possible. Because if we are not selling there our competitors will! Why miss out on sales to more than 300 million customers?